Mobikin iPhone data eraser for iOS is one of the top Apple device erasers on the market. If provides you with an easy to use package that erases any data you want gone with 0% recoverability. If you have decided to give away your iPhone, you need to protect your data. This is because your iPhone stores everything you do on your device like Safari browsing history, passwords, banking info and a lot more are stored on your device in caches, logs etc. You don’t want all this information out there when you sell or give away you iPhone. 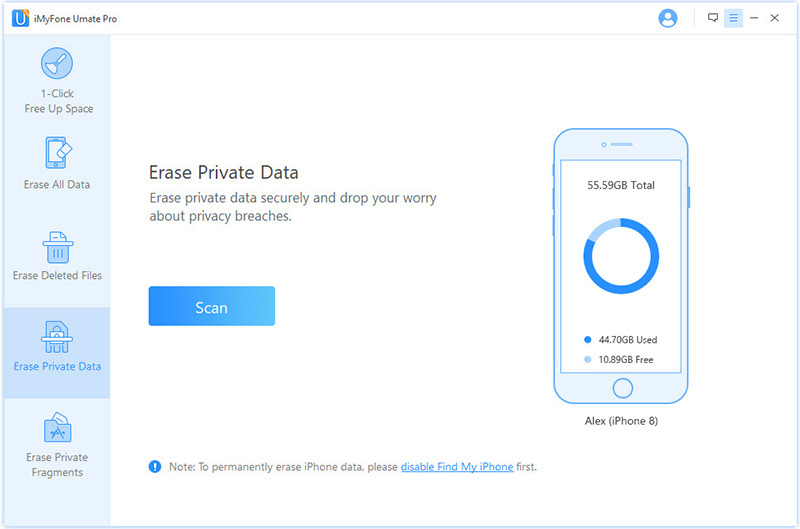 Mobikin iPhone data eraser helps you erase all this data permanently. No feature for erasing data by 3rd-party apps, like messages, photos, videos, or documents, etc. No feature for erasure of data fragments kept in 3rd-party apps. No way to back up iPhone photos and large files to computer or external hard drive. Its official website has not been updated for a long time. Its Guide page and What’s New page are blank. The latest review on its website is on July 24th, 2017. It’s suspected that the eraser itself has not been updated or maintained for a long time. Actually, it’s not recommended to purchase a program which is not updated frequently. We all know that no app is 100% perfect. Instead of Mobikin iPhone Data Eraser, here we introduce you two other iPhone cleaning and data erasing tools that you can get your hands on. They are the best alternatives to Mobikin and provide you with data erasing prowess similar and even superior in some cases to Mobikin. iMyFone Umate Pro is a market leading iPhone data eraser that provides an ultimate erasing experience. It is a powerful data cleaner and eraser that leaves no stone unturned in guaranteeing your privacy and leaving you secure. Wipe Deleted Files: You can see which deleted files still remains on iPhone and completely erase them. Erase All or Selected: Enable you to erase unwanted data and keep important files, or wipe the whole iPhone to start afresh. Clear 3rd-Party Apps Tracks: It will scan and show you the private tracking left by Snapchat, Facebook, Chrome, etc. You’re able to fully remove them. Supported Files: Wipe messages, call history, photos, videos, contacts, notes, voice memos, and all iOS file types. Boost iPhone Performance: Just one-tap clean cache, cookies, logs, corrupted files, temp files, etc. from iPhone for free. Step 1: Launch Umate Pro on your PC or Mac. You will find yourself on the homepage. Make sure connect your Apple device to your computer. 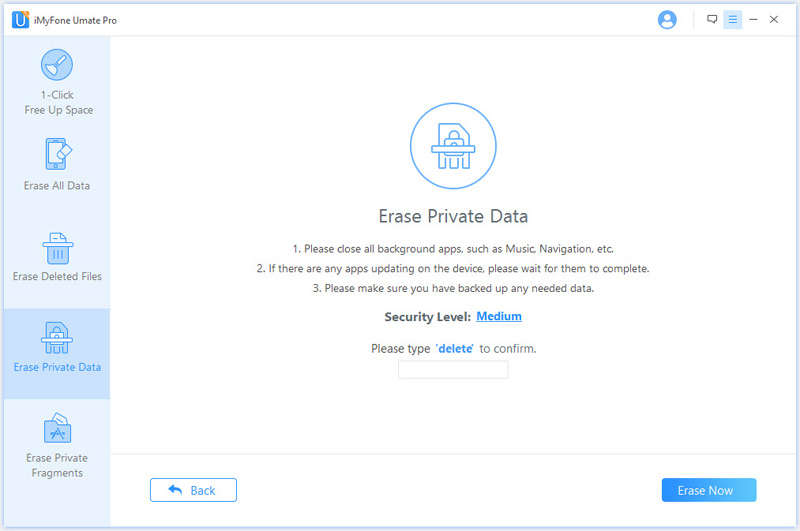 Step 2: You can pick from four erasing options available on the Umate Pro homepage, like Erase Private Data which allows you to selectively wipe sensitive files. Click Scan. 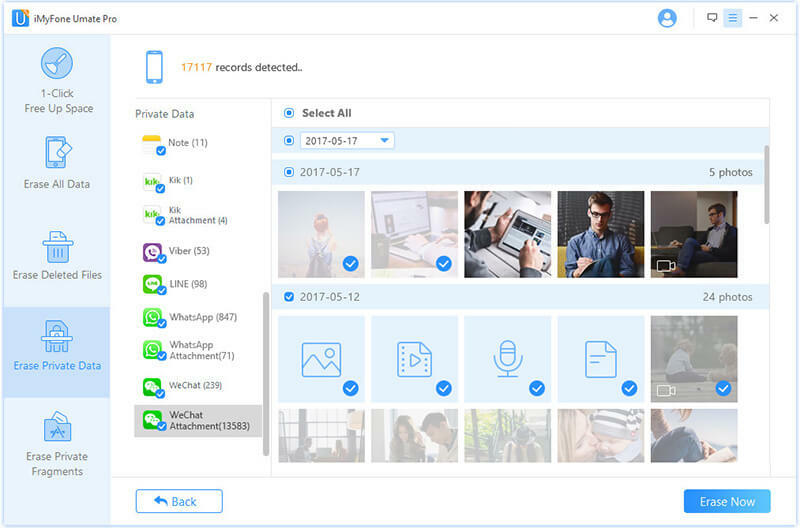 Or select Erase Deleted Files if you would like to see which deleted files still remains on your device and completely erase them to be unrecoverable. Or select Erase All Data if you want your iPhone to start afresh. It’s much safer than a normal factory reset. Or select Erase Private Fragments if you want to keep 3rd-party apps clean that no sensitive traces are left on your device. Or select 1-Click Free Up Space if you want to boost your iPhone performance. Step 3: When scanning finishes, you can double-click each category to preview data and select the files you don’t want. Then click on Erase. Step 4: Type “delete” into the box and click the Erase Now button to confirm. Keep your device connected to your pc and do not use it while the erase process is ongoing. Note: You can select a security level depending on your needs, before you click Erase Now button. Get rid of previously deleted data in a secure and efficient manner. Support to preview and erase WhatsApp/WeChat/Kik/Viber data. Private traces or tracks left by 3rd-party apps can be completely wiped from iPhone. Choose from 3 security levels to determine how deeply you want to erase your data. Erase all your device data, content and settings in one click. No need to start hunting them down one by one. Easy to use interface that lets you get your business done in minutes. 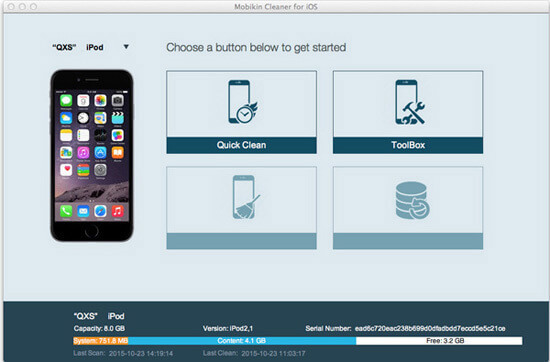 PhoneClean is a high level iPhone cleaner and management tool. It allows you to clean your iPhone, manage your space and maintain your privacy, all in one easy to use package. You can also easily backup and restore your iPhone with this great iPhone tool. Provide you highest standard in privacy security and keep everything sensitive getting erased. Keep your internet browsing private, leaving no trace behind. Clean old-school iPhone or iPad and make a boost-up. Wondering how these three compare? Here’s a table to help you out. In our opinion, according to the table above, we prefer to choose the iMyFone Umate Pro which provides more useful functions and always be updated. We could expect more features on it.